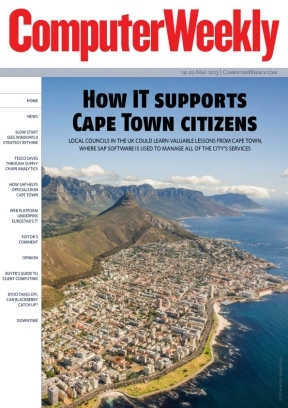 In this week’s Computer Weekly: we visit Cape Town to find out how the South African city worked with SAP to manage citizen services, and what lessons UK local government could learn. Tesco tells us how it saved £100m in its supply chain by using business analytics. Is the Start button making a comeback? We examine Microsoft’s response to the lukewarm reaction given by customers to Windows 8. And our buyer’s guide to client computing concludes with a look at the market for workplace services. Read the issue now. Transforming the city’s operations, SAP software provides a multi-dimensional view of Cape Town’s citizens and helps meet their needs. The retail giant’s approach of measuring, modelling, testing and acting has proved successful, paving the way for future projects. Amid lacklustre take-up of Windows 8 and a declining PC industry, Microsoft could be set to rethink its strategy for Windows 8, with hints the much-loved Start button may return. The market for workplace services is evolving rapidly as a conventional and highly mature approach to desktop and desk-side management yields to a transformed workplace services environment in which assumptions about customer preference, behaviours and even devices are up for grabs. Users drive BYOD take-off, but can BlackBerry catch up? Many would agree bring your own device (BYOD) has already happened. The question now is how organisations deal with it and what the consumer push to open up the variety of corporate devices means for BlackBerry. Eurostar CIO Christophe Lemaire talks about improving the customer experience, from ticket purchase to the provision of real-time travel information. For user empowerment to be successful, the right culture and mindset must be combined with the right tools and effective management, writes Tony Lock, programme director at analyst Freeform Dynamics. This week's Computer Weekly is sponsored by Accenture and Newham London.